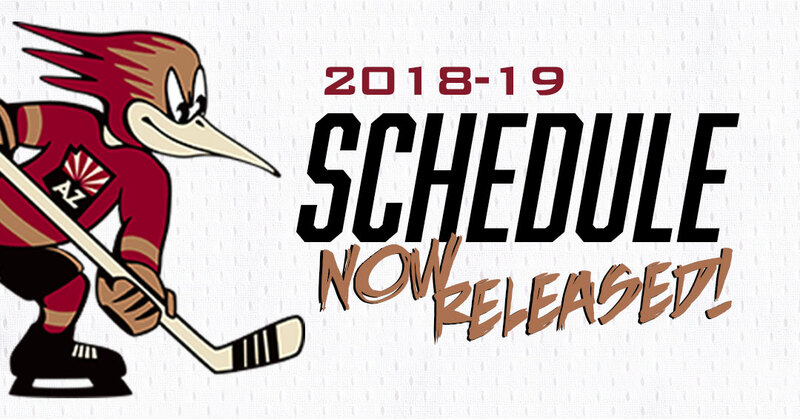 TUCSON, AZ – The Tucson Roadrunners, proud American Hockey League affiliate of the Arizona Coyotes, announced today the club’s schedule for the 2018-19 season. The Roadrunners will play a total of 68 regular season games (34 home and 34 away), opening their third season in the Old Pueblo on Saturday, October 6 at Tucson Arena against the San Diego Gulls, affiliate of the Anaheim Ducks. The AHL’s scheduling format will see the Roadrunners play 52 of 68 games against teams in the Pacific Division. Tucson will face the league’s newest member club and affiliate of the Colorado Avalanche, the Colorado Eagles, 12 times. The Roadrunners will face the remaining five divisional teams eight teams each for a total of 40 games. In addition, the Roadrunners will play four out-of-division opponents; the Chicago Wolves (Vegas Golden Knights), Iowa Wild (Minnesota Wild), Rockford IceHogs (Chicago Blackhawks) and Texas Stars (Dallas Stars). The Roadrunners busiest months of the season will be December and March with 12 games each. The 2018-19 schedule contains 32 back-to-back sets. The 2019 Lexus AHL All-Star Game presented by MGM Springfield will take place on Sunday, January 27 and Monday, January 28 at the MassMutual Center in Springfield, Mass. Full season membership for the 2018-19 season are on sale now. In addition, the Roadrunners are currently accepting deposits for half-season memberships, which start as low as $13 per seat, per game. Partial Season Memberships include opening night and 11 games while starting at just $168. For more information on Roadrunners tickets, call 866-774-6253. October 6: Home opener against the San Diego Gulls (I-8 Border Rivalry Game) at Tucson Arena. October 19: The Rockford IceHogs (affiliate of the Chicago Blackhawks) make their first trip to Tucson. November 9: The San Jose Barracuda visit the Old Pueblo for the first time since the first round of the 2018 Calder Cup Playoffs. November 21: Join the Roadrunners as they face the Stockton Heat on the eve of Thanksgiving. December 11: The expansion Colorado Eagles make their inaugural landing in Arizona. January 11: Chicago’s Wolves return to Tucson once again. January 25: Led by new head coach Jay Woodcroft, the Bakersfield Condors will start their first trip of the season to Tucson. March 19: For the second consecutive year, the out-of-division Iowa Wild come to the desert. March 24: The only Sunday contest of the season at Tucson Arena, the new-look San Jose Barracuda are in town. April 13: Just like last season, the team will end the regular season with a pair of games against the San Diego Gulls (I-8 Border Rivalry Game).